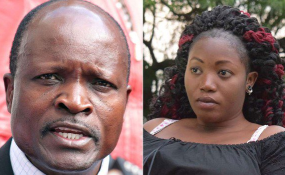 Governor Okoth Obado and murdered Rongo University student Sharon Otieno (file photo). Ms Otieno's father Douglas Otieno told the Nation that the family was less concerned about Mr Obado's sympathy messages as they seek for justice for their daughter. "I don't know about his condolence messages and I don't even wish to know," Mr Otieno said. "If they were meant for you (media), just keep them to yourselves. I have nothing to do with them. He (Governor Obado) has never been my friend and has not been close to me so I don't want to know about them (condolences)." Mr Obado on Wednesday publicly distanced himself from Sharon's murder and condoled with the family. He said he had "nothing and absolutely nothing" to do with the brutal murder of the student. Ms Otieno's mother Melida Auma told the Nation that her daughter was in a relationship with Mr Obado, claims the governor confirmed. On Thursday, a statement was posted on Mr Obado's wife's Facebook page saying she had accompanied "my beloved husband" to a press conference and wished Sharon's soul a good rest "in paradise". It was however pulled down soon afterwards. Mr Obado, who said he has been devastated, ridiculed and embarrassed by the demise of Ms Otieno, accused some unnamed politicians of linking him to the murder, and the media of giving him "medieval punishment". Detectives from the Directorate of Criminal Investigations' Homicide Investigations Unit, Serious Crimes Unit, Special Crimes Prevention Unit and the Cybercrime Investigations Unit have been trying to piece together the murder jigsaw puzzle by taking statements from witnesses.